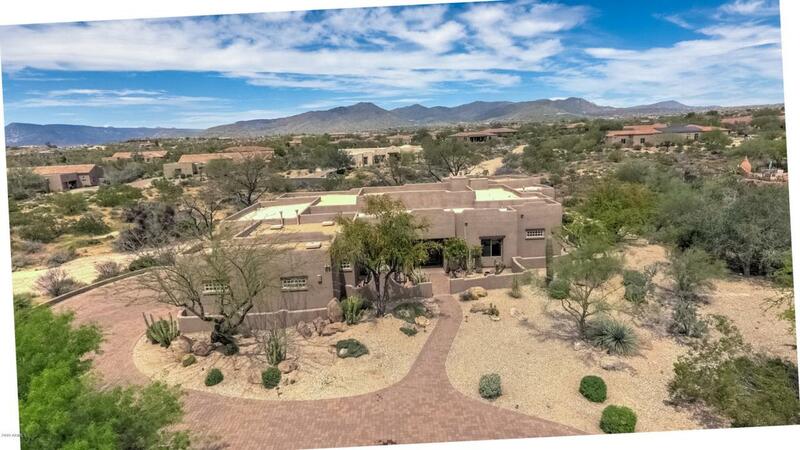 Beautiful 4 bed (plus den)/4.5 bath single level home on over 1 acre in the private gated Scottsdale community of Vista Viento Estates (where there are only 13 other custom homes).FULLY SELF CONTAINED GUEST HOUSE is perfect for next gen situations! Well thought-out floor plan is bright & open w/ upgrades throughout. Spacious, window lined great room w/ stacked stone fireplace & entertainment wall. Spectacular kitchen is a chef's dream w/ its SS appliances, including double ovens, top of the line gas stove & sub-zero style fridge, pristine cabinetry, granite counters & 2 huge islands. Middle island has sink & is perfect for prep work, while outer island can be used for serving buffet and/or bar-top seating. Built in desk/work station is a plus.